See your DVS Setup Sheet for specific recommendations. TYPICAL EMULATOR VALVE SPRING SETUP - For Vintage applications most Riders prefer the Blue 40 lb/in Valve Spring with 2-4 turns of preload. The best working range is 1-5 turns; if less or more Emulator Valve Spring Preload is needed change Valving Spring Rate. Move to the softer 26 lb Silver Spring OR up to the 64 lb Yellow Spring with 3 turns as the starting setting. Total tuning range is 1-6 turns for any given Valving Spring. Gold Valve Emulators are supplied with optional Valve Springs. Available Valve Spring Rates are: 26# Silver, 40# Blue/Black, 64# Yellow/Gold, 101# Red. OIL VISCOSITY - 15wt Fork Oil is typical. Oil Viscosity (weight) is used to set Rebound Damping. Once the proper Rebound Damping is achieved the Emulator can be adjusted for Compression Damping. OIL LEVEL - Common Oil Level is 130 - 160mm (Fork Spring out, chrome tube at the bottom of the stroke, measuring from the top of the oil to the top of the fork tube). Oil Level Tuning Range is 100-180mm in general. The Damping Rod must be covered with oil at full extension. Also, be sure not to exceed the maximum oil level as the fork will run out of compressable air space and it will inhibit full travel. MAIN FORK SPRING PRELOAD - For Street the most common initial Fork Spring Preload is 10 - 25mm with RT Hi-Performance Fork Springs. The Tuning Range for Street is 5-35mm. The Range for Dirt is 2 – 15mm. Smaller OD 30-35mm Forks/Light wieght bikes may prefer 26lb/in or 40 lb/in spring at 2-4 turns range based on use and rider preference. Larger heavier bikes and/or Larger Fork OD 36-49mm size may prefer the 40 lb/in or 64lb/in. spring at 2-4 turns range based on use and rider preference. Use oil viscosity to set rebound, this affects traction and stability. Heavier oil equals slower rebound, lighter oil equals quicker rebound. * Measured from zero preload (no tension) on the Valve Spring. To find zero preload back off on the adjuster bolt until the spring is loose then tighten it until the spring just touches. ** Use oil viscosity to set the amount of rebound damping, then adjust the compression with the Emulator settings. The Emulator does not affect rebound, however oil viscosity does. *** The primary compression adjustment is the amount of Emulator Valve Spring Preload. Increasing Valve Spring Preload makes the fork stiffer. The effect of all the variables will overlap providing extreme tuning flexibility. The Gold Valve Emulator controls Compression Damping as the fork hits the bump. 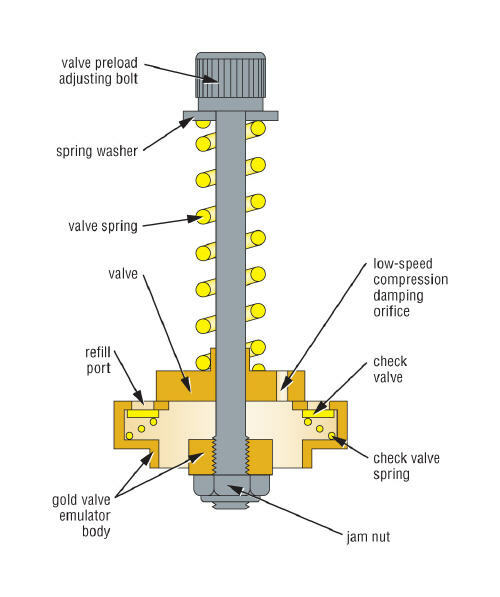 More or less Gold Valve Emulator spring tension (preload) makes compression Stiffer or Softer. Changing to different rate Emulator Valving Springs will Increase or Decrease overall stiffness by changing the slope of the damping curve (it will also effect the fork speed at which the valve plate opens). A Half Turn of Emulator Spring Preload is noticeable, a full turn is significant. Tune in half turn increments until you find the best setting. Another tuning variable for low-speed compression damping is the number of bleed holes in the Emulator Valve Plate (under the colored valving spring). Emulator Plates may have either 1 or 2 pre-drilled holes in the valve plate. Adding additional holes (up to 4, same size as originals) will add plushness to low speed fork response (small bumps, slow fork movement). This is a good way to address fork chatter issues you may encounter on the race track or harshness over small ripples and such on the street or trail. These holes control oil flow that is too low to open the spring loaded valve plate. NOTE: Bleed holes have little effect on high-speed damping (large bumps, fast fork movement). Oil Viscosity controls Rebound Damping; how quickly the fork extends after the bump. Thicker oil slows fork movement down, thinner oil speeds it up (5/10/15/20/30wt etc). Please note that Suspension Oils are not constant in viscosity between brands! Choose a brand and stay with it to ensure consistent results when making changes! NOTE: Oil viscosity should be used for tuning rebound damping. For compression damping, adjust the Gold Valve Emulator Valve Spring Preload, Valve Spring Stiffness or number of Bleed Holes. Main Fork Spring Preload controls Ride Height. 15-25mm is the useable range for Street. For Dirt 3-5mm is typical. Move down/up in spring rate if you fall out of this range. NOTE: Tune in 2 - 3mm increments using washers supplied with the spring kit (or adjust spring preload spacer length when needed). Oil Level controls bottoming along with fork stiffness in the last 30% of fork travel. Tune in 10mm increments. Measure the oil level with the Fork Spring out, Gold Valve in, chrome tube at bottom of stroke, top of fork tube down to the top of the oil. NOTE: Tuning fork oil level will only affect the feel in the last 30% of fork travel. Use this variable to address bottoming issues or if not using most, or full, fork travel. We encourage experimenting with settings to find your personal ‘sweet spot.’ Always take notes and record your changes. It is easy to go back to the original settings if needed. For more details on how Emulators work.